This 'Hairdresser' mural is ready to 'order and print' - or you may customise it. 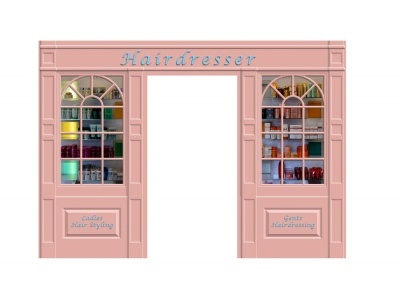 This Shop Front, here configured as a Hairdresser, is modular in design, and may be configured to represent any type of shop or hostelry to suit your purpose. Please view the How To Customise Tab to see how you may personalise your mural. This Shop Front comprises three drops of wallpaper (one above the door and one on both sides). It is designed to fit around a standard size door frame, and at 240cm high, it is intended for walls under 280cm high. View the Details Tab for more information. Installing our mural wallpaper is straight-forward and easily accomplished. All our mural products come with full installation instructions and a setting out diagram. View the About Installation Tab for information on measuring, planning and for advice about how to install your mural. View the Material Options Tab to find details about the different wallpaper and print materials that we have available. If you require a Door Print with your mural, please select the alternative Shop Front mural with a Door Print included. For more detailed information about materials, please view and download our Material Specifications. To order a material sample, please see View & Order Samples. If you have any questions that you cannot find answers to on our website, simply call our friendly and knowledgeable team on 01283 712171. View the Layout Diagram image on the product page to find details about the different wallpaper and print materials that we have available. If you have any questions that you cannot find answers to on our website, please call our friendly and knowledgeable team on 01283 712171. As standard, our murals are printed onto high-quality traditional fabric-backed wallpaper with a Smooth Surface. But you may select an alternative high-quality material for your mural, if you prefer, on the Product Page. Material options are briefly described below. For more information and technical specifications, please see Wallpaper Materials. Our standard ‘paste the wall’ wallpaper is durable and easy to install. The smooth surface has a satin matt finish that provides superb, vivid colour representation. Also a ‘paste the wall’ wallpaper and equally durable and easy to install. The canvass-like texture helps to reduce reflective light glare on the surface especially when viewed obliquely, such as on some corridor. This texture also helps to hide imperfections in the wall surface (such as where holes may have been filled in the past). This self-adhesive vinyl material is robust and tear-resistant. The applied laminate has a satin matt finish and adds some protection against spills and scrapes. It is very easy to install and has a high-tack adhesive that will adhere to most normal wall surfaces. This self-adhesive polyester material is tear-resistant and has a matt textured finish. It is very easy to install having a low-tack adhesive, and has the added advantage of being repositionable if necessary. It also leaves no adhesive residue when removed. To order a material sample, please click View & Order Samples. 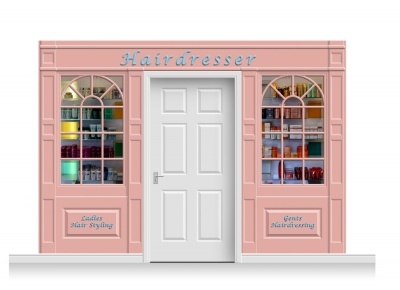 You may customise this Shop Front to create a truly unique mural for your care home. If you want to customise, or are just considering it, please Save the Shop Front to your Basket and then call us on 01283 712171 to discuss your requirements. Or send us an email outlining what you want and we will contact you. Customising you mural will add £60.00 + vat to the price (plus charges for any image use licenses that may apply). We will of course send you an artwork image including your customisation choices for your approval before proceeding with your order to print. You may replace the standard text for all or some of the signs within the mural with that of your choice, or choose to remove some of the text altogether. For example, you might choose to change the sign above the door to reflect your type of shop, and perhaps to include the name of your care home. Or make the window signage more relevant to your purpose. It really is very easy to install our wallpaper murals. All you need are some basic DIY skills and tools to achieve perfect results. 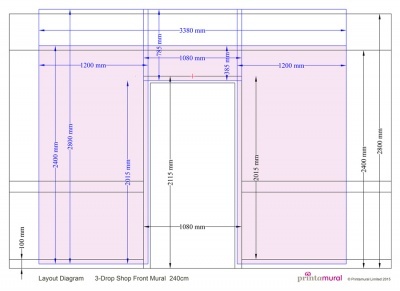 All our wallpaper murals come with a Layout Diagram that shows all the necessary dimensions for positioning your mural. Our comprehensive Guides have lots of useful information to help you achieve a perfect job. Our Instructional Videos demonstrate installations step by step. Click the Accesories Tab to find and purchase suitable wallpaper adhesives and some specialist tools. And remember, if you have any questions that you cannot find answers to on our website or in our Guides, you can call our friendly and knowledgeable team on 02183 712171. We are always happy to help. Click the ‘Layout Diagram’ picture for your selected mural product to view an outline drawing with all critical dimensions shown. You can download this diagram on the Information Tab. You should use this information to verify the fitting and setting out of your mural onto your wall space and around the door (if applicable). It is important to check that the overall width and height of the mural will fit your wall space. If applicable, it is also important to determine that the width and height of your door frame and door all fit comfortably with the mural dimensions indicated. Watch this informative video 'How To Measure Up A Mural To Fit Your Wall' or click here to see our How To Measure Up for a Mural. Successful installation is easily achievable using a few basic tools and readily available wallpaper pastes. For your guidance, full Instructions and a Setting Out Diagram are supplied with every mural product. You may also view and download our How To Install Guides that include a list of the tools you will need. These instructions also suggest how best to prepare your wall and door surfaces for installation. You may also like to watch our Instructional Videos (see below) to see how easy it is to install our wallpapers and prints. Please also refer to our material specifications for information about suitable wall finishes. Our traditional wallpapers are applied using the ‘paste the wall’ method. The wallpaper ‘drops’ are all provided 50mm oversize, and so may be trimmed to fit irregular wall edges and around door frames. Adjacent ‘drops’ are applied overlapping each other and then trimmed through the overlap to provide a seamless joint. Simply locate the ‘drop’ in the correct position, gradually peel the backing paper away and down, and smooth the wallpaper down as you go. The ‘drops’ are all oversize and may be trimmed to fit your wall space. When using our Laminated wallpaper, adjacent ‘drops’ are left to overlap and do not need to be further trimmed. For our Repositionable Wallpaper, adjacent 'drops' are applied overlapping each other and then trimmed through the overlap to provide a seamless joint. This wallpaper may be re-applied if you do not get it right first time. Our vinyl Door Prints are produced 25mm oversize. Locate the print in position, tape to the top of the door, and smooth down as you pull the backing paper away and down. Then trim to the door edges.